Walter Elias "Walt" Disney (December 5, 1901 – December 15, 1966) was an American entrepreneur, animator, voice actor and film producer. A pioneer of the American animation industry, he introduced several developments in the production of cartoons. As a film producer, Disney holds the record for most Academy Awards earned by an individual, having won twenty-two Oscars from 59 nominations. He was presented with two Golden Globe Special Achievement Awards and an Emmy Award, among other honors. Several of his films are included in the National Film Registry by the Library of Congress. Born in Chicago in 1901, Disney developed an early interest in drawing. He took art classes as a boy and got a job as a commercial illustrator at the age of 18. 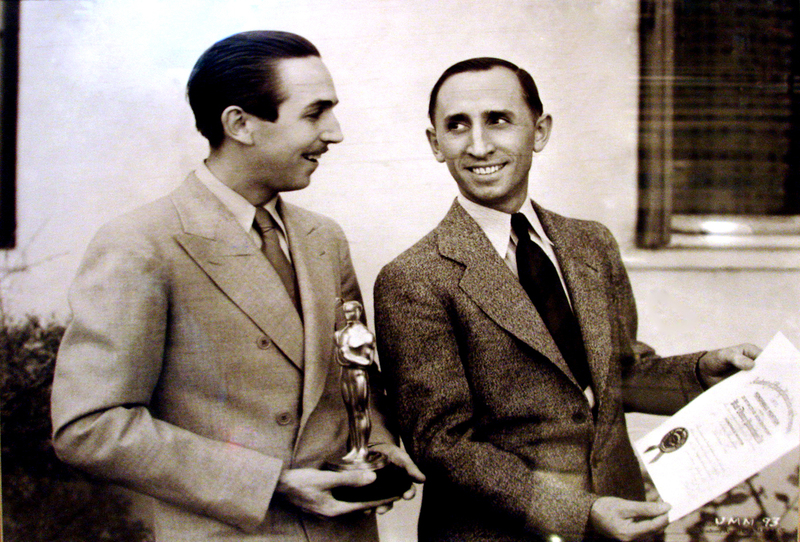 He moved to Hollywood in the early 1920s and set up the Disney Brothers Studio with his brother Roy. With Ub Iwerks, Walt developed the character Mickey Mouse in 1928, his first highly popular success; he also provided the voice for his creation in the early years. As the studio grew, Disney became more adventurous, introducing synchronized sound, full-color three-strip Technicolor, feature-length cartoons and technical developments in cameras. The results, seen in features such as Snow White and the Seven Dwarfs (1937), Fantasia, Pinocchio (both 1940), Dumbo (1941) and Bambi (1942), furthered the development of animated film. New animated and live-action films followed after World War II, including the critically successful Cinderella (1950) and Mary Poppins (1964), the latter of which received five Academy Awards. In the 1950s, Disney expanded into the amusement park industry, and in 1955 he opened Disneyland. To fund the project he diversified into television programs, such as Walt Disney's Disneyland and The Mickey Mouse Club; he was also involved in planning the 1959 Moscow Fair, the 1960 Winter Olympics, and the 1964 New York World's Fair. In 1965, he began development of another theme park, Disney World, the heart of which was to be a new type of city, the "Experimental Prototype Community of Tomorrow". Disney was a heavy smoker throughout his life, and died of lung cancer in December 1966 before the park or city was completed. Disney was a shy, self-deprecating and insecure man in private but adopted a warm and outgoing public persona. He had high standards and high expectations of those with whom he worked. Although there have been accusations that he was racist or anti-semitic, they have been contradicted by many who knew him. His reputation changed in the years after his death, from a purveyor of homely patriotic values to a representative of American imperialism. Nevertheless, Disney is considered an international cultural icon, particularly in the United States, where the company he co-founded exists today as one of the world's largest and best-known entertainment companies.